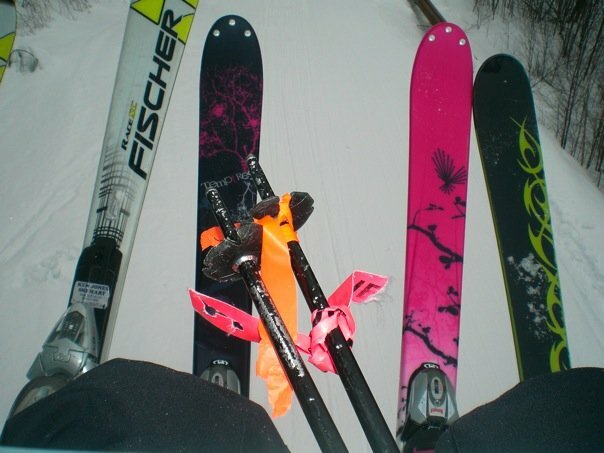 When I started skiing with my parents, my cousin, her family and friends’ families on New Years Eve, I was low. I don’t like starting anything low, but a temp basal plus a juice box plus a chair ride up to the top of the mountain are better to start than most other activities. As I’ve mentioned before, I don’t bring my meter on the slopes. I took it easy all morning because I felt low. After a few runs runs I took some tabs but the low feeling still would not go away. So finally around 11AM, I look at my cousin on the chair and say “I need sugar.” Her boyfriend looks at me and starts telling me about the mental image in his head. This includes me coming out of the lodge with a bag of sugar and pausing every so often to take a swig. Some days it certainly feels like I need a bag of sugar, but hopefully I’ll never need that much. But in the mean time, I enjoyed laughing at the mental image of skiing with a bag of sugar.